Fuchsia 'Autumnale' rooted easily from cuttings. Beneath the carefully-blended soil, roots of the plants I've saved for the winter are taking hold. I can tell this by their leaves, which plump up. 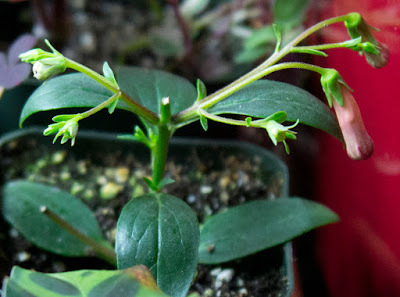 Eventually, tiny new leaves will sprout from their stems. 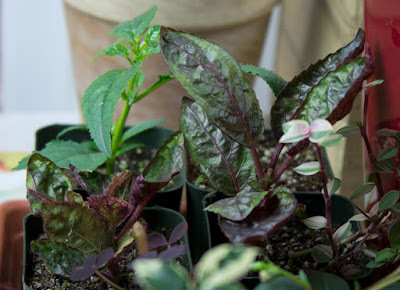 Hemigraphis 'Exotica' or purple waffle plant. We haven't had a killing frost yet. At least not one severe enough to banish the banana or kill off the Colocasia. Truthfully, things aren't looking that great as a whole, but taken a bit at a time, it's really not bad. Phygelius 'Winchester Fanfare' was very easy to root. Inside, nearly all of my cuttings have rooted. All that's left is to keep them thriving for the next five months, and I'll have a jump on next season. 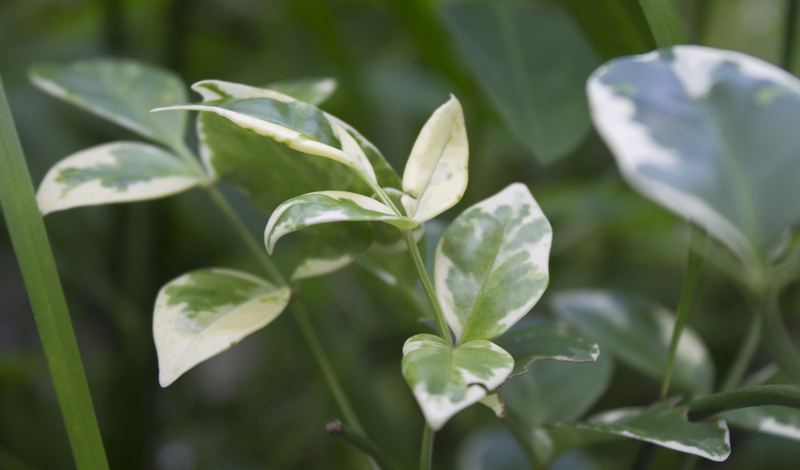 The plants I'm really excited about growing in the winter are the tropicals like Pandorea jasminoides variegata and Phygelius ‘Winchester Fanfare’. The Phygelius (Cape fuchsia) bloomed quite well through the summer, luring the hummingbird away from the other goodies I had planted. Even now, the cutting shows no signs of being slowed by its flowers. I removed them, though, to make it easier on the plant as I preferred its energy be devoted to forming roots. The Pandorea (bower vine) didn't get around to blooming this year, although it was attractive anyway with its variegated foliage. I'm hoping to give it a big headstart next summer so perhaps this 20 to 30-footer will flower. 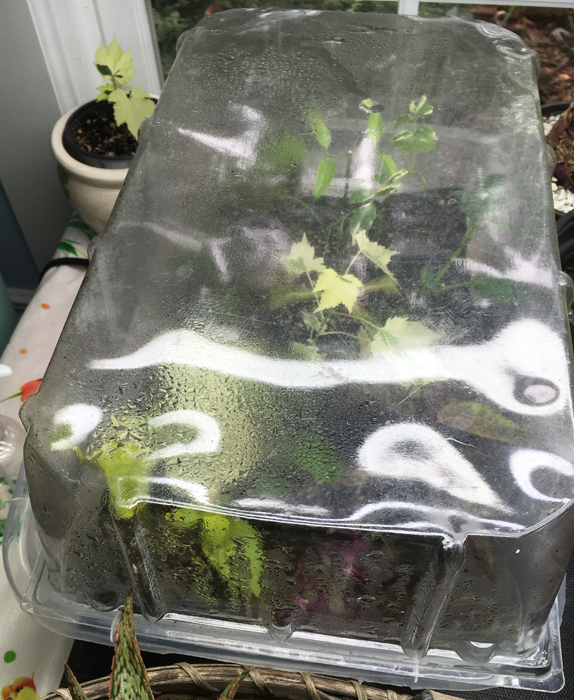 Plants rooting under humidity dome. 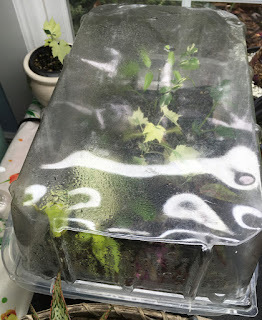 (annual geraniums), which can usually come out of the humidity tray set-up in less than 10 days. Pelargonium 'Distinction' is one of several annual geraniums I'll be growing indoors this winter. 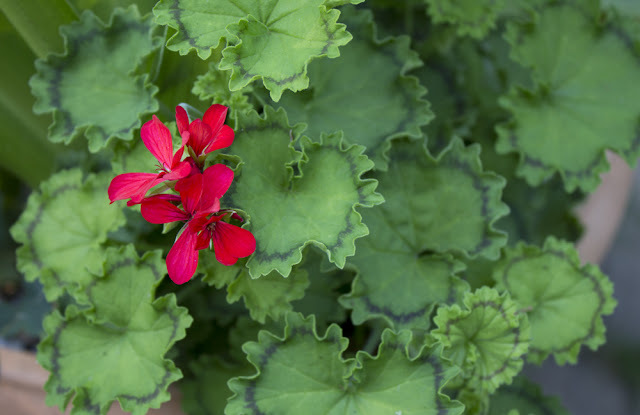 Labels: annual geranium, growing indoor plants, Pelargonium, starting plants indoors, taking cuttings, unusual houseplants. I have brought all of my house plants in. They have been inside for 10 days or so. I could have left them out as it is but we had one cold day in the 30's after a week of 40F lows. I was worried they would all die or be terribly damaged. Luckily not so. Today I split a Rabbit's foot fern into 4 pieces and composted the remaining lump. It was so big and entirely too heavy to hoist into the tub for it's weekly watering. I just couldn't deal with it. I am giving away several starts. It is a busy time of year. I wish once again I had a green house. 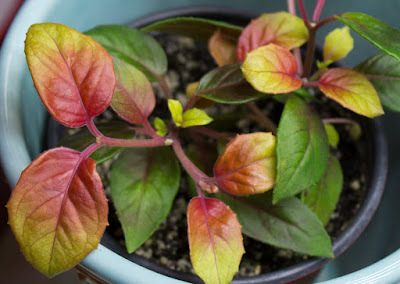 I'm not sure if we're getting more sentimental about plants or we're finally finding plants worth growing year-round. The choices of plants have widened considerably in the past 20 years.